While planning my Vietnam trip, I already imagined myself wearing a conical hat while riding a rowboat along the Mekong river. It was that vivid. I made sure that it happened. Exactly how I envisioned this shot to be. I booked the whole-day tour of the Mekong Delta through my hotel. 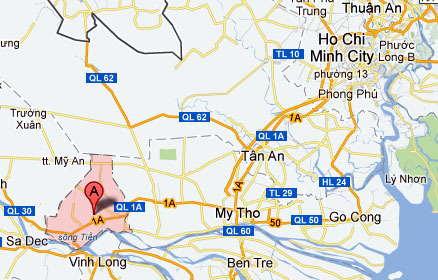 The Cai Be and Vinh Long districts were far from Ho Chi Minh City for a DIY adventure. The tour cost 357,000 VND (~Php 714), which included transportation and lunch. The Cai Be district is highlighted in red. The blue parts below it is the Mekong river. Going to Cai Be is a 3-hour ride from HCMC (upper right). After three hours in the coaster, including a washroom break in between, we arrived at the Cai Be district to tour the Mekong Delta and see the floating market buyers. And, oh, don't worry. There are life vests in the boat. The floating market wasn't as busy as I expected it to be. It wasn't like in the photographs where the river was full of boats. I guess this happens early in the morning or maybe on weekends. The item displayed on the rod in front of the boat indicates the item being sold. Aside from seeing brown water, boats, more boats, and items being sold, I enjoyed seeing the houses and structures along the river banks. 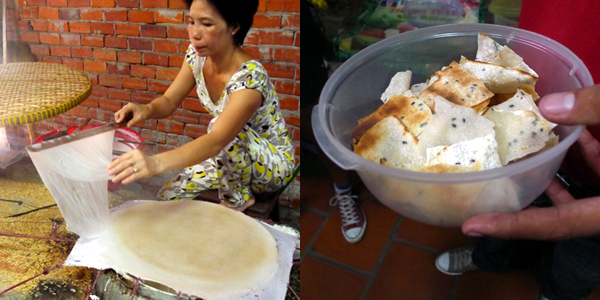 We got off this place where we enjoyed learning about how local delicacies were made! Very interesting! I wish I could have taken more notes to share with everyone. 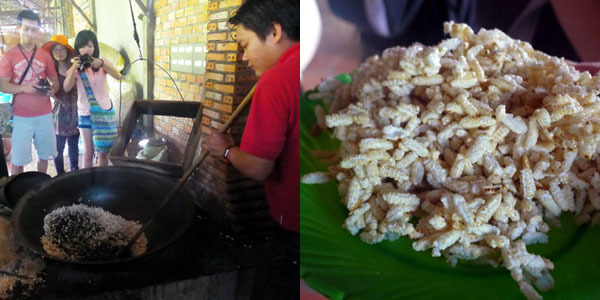 A local version of what seemed like rice krispies. This reminds me of lumpia wrapper but crispier! 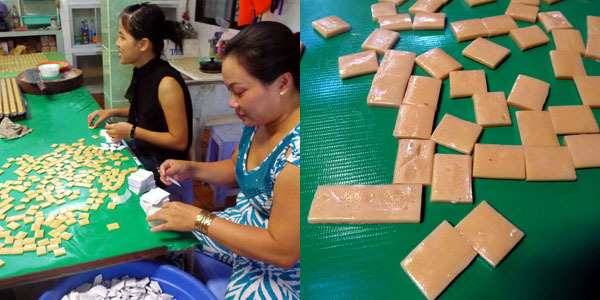 We were taken through the steps on how coconut candies were made. 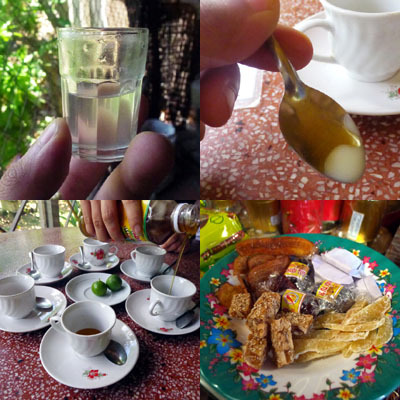 Treats that we had: rice wine, royal jelly, locally produced honey with tea, and local snacks. I caused the boo-boo on the table. Whoops! Friends I made that day: (L-R) Kjell from Norway, Chelsea(?) from Australia, Shang-Shang and Mike from China. It was cute seeing the kids swim. Imagining how dirty the water is... well. Yikes. Notice how deep the water is even if it's just a few meters away from the "shore". Vietnamese ladies rowing the boats came to pick us up for lunch! Conical hats are lent to tourists, though I bought one before the tour for 20,000 VND (~Php 40). The Elephant Ear Fish was the highlight of our lunch! This was freshly caught from the river. 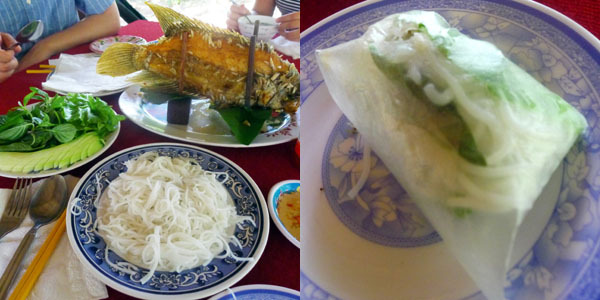 While it tasted like the regular fried tilapia, how it was eaten was its charm: lumpia style! Price: 170,000 VND (~Php 340) Good for two to three people. The cost of the fish is on top of the tour package. The tour guide mentioned this a lot but there were some foreigners in our group who never got it. Such commotion over fish! After eating lunch came another highlight: biking! Reminded me of Eat, Pray, Love! It's been more than a decade since I last rode a bicycle. Attempting to ride a bike after more than a decade! The most interesting thing I noticed: tombs in the back yard! We continued on boat to Vinh Long city to see a really huge market, though it wasn't that interesting. The bus going back to Ho Chi Minh City was waiting for us there.